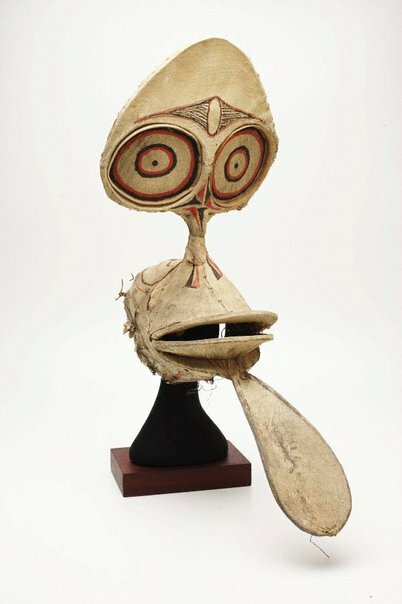 'Kavat' masks are made of tapa cloth stretched over a rattan framework, and are painted black and red and sometimes also yellow. The distinguishing features of 'kavat' masks are out-size round eyes and a dangling or bent appendage below the mouth. Because of their form and, more importantly, because of the way they are painted, these masks are linked with various animals and plants. Leaf or pig spirits are represented in conjunction with flora and fauna encountered in the bush or hunted there, and many other animal motifs are also used.